The image above shows the tools commonly used in forming sheet metal. It is a good idea to have these pieces of equipment sitting on 1/2 inch rubber to help deaden the sound of mallet strikes. Use a brass or copper mallet when striking metal tools such as dapping punches. You reduce chances of fracturing a steel hammer (or a steel dapping punch) when you use softer metals such as copper and brass as the striking tool. Swage (front row left) – I remember the day I decided I had to have a swage. I was making a long, narrow pair of earrings from sheet metal and I wanted them to curve from side to side. When my new swage arrived it came with no punches. How was I going to form the metal evenly without punches? I ended up having them custom made (please see the white, round Delrin® punches on top of the swage and the black Delrin® punches behind). Good thing there was no rush on getting those earrings done! Fortunately a punch is now available that fits the three smaller curved spaces. A curved wood surface can be used in place of the black punches. Horn Anvil (front row, right) – A horn anvil is indispensable in the studio. The one in the photo is 10 pounds (dimensions: 11” L x 8” H x 1-3.25” W). Five pound horn anvils are also useful. They can be used to: center punch, straighten, and texture. When I rivet on a cuff I like to work over the horn of the anvil. Dapping Set (middle row, left and right) – Perfect for shaping discs into semi-hemispheres. Giant curves to teeny-tiny can be made using these two sets. Wood Forming Block (back row, middle) – In case you want even a larger curve than the metal dapping set provides, a larger wood forming block can be used. I often use this shallow surface to hammer shapes into metal, especially when I want a hand forged look. 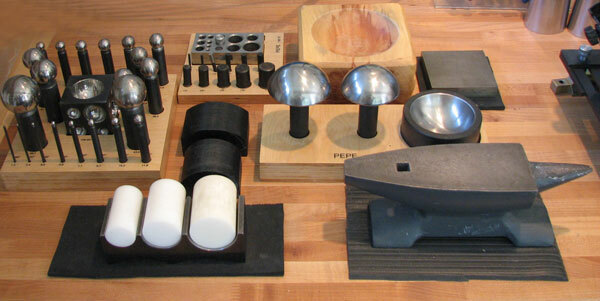 Steel Bench Block (back row, right) – Used for flattening and shaping wire. I also like to straighten sheet metal between two steel bench blocks. Insert the metal between the blocks and strike with a brass mallet.